In a rapidly evolving world in which technology continues to make significant advancements, engineering is an important and lucrative occupation. The U.S. Bureau of Labor Statistics projects a 7% increase in employment in engineering occupations by 2026. Engineering encompasses a wide array of careers, including computer hardware engineer, environmental engineer, mechanical engineer, nuclear engineer, civil engineer, and industrial engineer. Some occupations such as marine engineer are growing at a faster than average rate. Consequently, an online engineering master's degree makes you a highly skilled and competitive candidate in today's job market, including when it comes to management and executive roles. Earning a degree online allows you to continue to earn your education while continuing to gain hands-on experience as a practitioner in the workforce. Online education is flexible, with many programs allowing you to complete coursework at your own pace. Additionally, online students save time and money by avoiding commutes. There are many engineering master's programs online, each of which has its own unique set of features and requirements. Degree requirements will vary based on your area of specialty. Moreover, each school maintains its own admissions and retention guidelines, which likely include minimum grade point average and a specific number of credits required to graduate. You may also need to submit graduate exam scores as part of your admission application. The classes you will take largely depend on the area of engineering in which you specialize. For instance, many schools offer programs in aerospace, civil, or electrical engineering. Students may consider a concentration in systems engineering, which strengthens abilities in systems analysis, risk management, and accounting and finance. Professionals in technical and corporate organizations interested in leadership positions may choose a program in engineering management. Engineering management classes include cost and quality control, organizational behavior, and engineering contract management. This specialization prepares students to sit for the Project Management Professional (PMP) exam. See also: What can I do with an Automotive Technology degree? University of Florida ranks #1 on The 50 Best Online Master's in Engineering Programs! Home to the renowned Herbert Wertheim College of Engineering, this Gainesville institution has a reputation for producing innovative research and successful engineers, entrepreneurs, and inventors. Its UF Edge distance learning initiative makes it possible for students around the country to pursue one of six engineering master's programs online, earning a master of engineering or master of science in civil and coastal engineering, electrical and computer engineering, environmental engineering sciences, industrial and systems engineering, materials science, and mechanical and aerospace engineering. Most of the 30-credit programs are built around 10 core engineering courses, with the remaining credits fulfilled through elective coursework related to the area of specialization. Certain elective requirements may be fulfilled outside of the engineering department. While most curricula do not include a thesis component, each program culminates in a comprehensive examination. Students must consistently maintain a cumulative GPA of at least 3.0 to earn a degree. All programs are presented in an entirely asynchronous format and can be completed in around 24 months. Applicants must hold a bachelor of science degree in a related field, earned through a regionally accredited institution, with an undergraduate GPA of at least 3.0. In addition to a personal statement, resume, and three letters of recommendation, prospective students must submit official transcripts and GRE scores of at least 155 quantitative, 146 verbal, and 3.0 analytical. UF students may transfer up to nine transfer credits toward their master's degree. Florida residents receive a tuition discount. UF receives regional accreditation from the Southern Association of Colleges and Schools Commission on Colleges. University of Michigan ranks #2 on The 50 Best Online Master's in Engineering Programs! Students interested in automotive and manufacturing engineering master's programs online will find five comprehensive master's of engineering degrees at the University of Michigan-Ann Arbor. Along with programs dedicated to automotive engineering, manufacturing, and a combination of the two, U-M distance learners may also specialize in energy systems and systems engineering and design. Each 30-credit program includes at least nine credits of core engineering classes and culminates in a capstone project. Systems engineering and design majors must fulfill a six-or nine-credit practicum requirement, and the global automotive program includes a secondary core engineering curriculum. Students may take courses on a full-or part-time basis, with part-time students completing the program in just over two years. Full-time learners often graduate in only one year. Prospective students must have earned a bachelor's degree in a related discipline from a regionally accredited institution. Along with official transcripts, applicants should provide an academic statement of purpose, a personal statement, professional resume, and letters of recommendation. Those applying to the automotive engineering program should have at least 18 months of professional full-time experience, and the global automotive program requires 12 months of professional experience and a minimum GPA of 3.0. Manufacturing master's candidates must have completed at least one semester-long undergraduate internship in the field. GRE scores are required for all five programs. Michigan residents receive a tuition discount. University of Michigan-Ann Arbor receives regional accreditation from the Higher Learning Commission. University of Virginia ranks #3 on The 50 Best Online Master's in Engineering Programs! UVA has offered a full range of accredited engineering master's programs online for more than 30 years. Designed with working professionals in mind, each program is presented in a web-based format that provides maximum flexibility without sacrificing academic rigor. In addition to systems engineering, distance learners may pursue an ME in chemical engineering, mechanical and aerospace engineering, materials science, electrical engineering, and civil and environmental engineering. Each program consists of 30 credits spanning 10 courses, with the exception of the systems engineering curriculum, which includes an additional two-credit supervised research course. All programs are intended for part-time students, and take approximately five years to complete. While many courses are presented in an asynchronous format, materials science students complete coursework synchronously, alongside their on-campus peers, in afternoon or early evening class sessions. Applicants must hold a bachelor's degree in a related field from a regionally accredited institution. GRE scores are typically required, but may be waived under certain circumstances. Other required documents include college transcripts, a statement of purpose, and three letters of recommendation. While the university accepts transfer credits, students must take at least half of their courses at UVA. After applying, prospective students should contact an academic advisor to begin planning their program of study. Virginia residents receive a tuition discount. UVA receives regional accreditation from the Southern Association of Colleges and Schools Commission on Colleges. Harvard University ranks #4 on The 50 Best Online Master's in Engineering Programs! Bringing the university's world-renowned academic programs to distance learners around the globe, Harvard Extension School offers web-based and hybrid graduate programs in more than 80 areas of study, including an MS in software engineering. Students enrolled in the online master's in engineering program must take one course at the university's Cambridge, Massachusetts campus. Harvard's engineering curriculum is built around five core courses in cloud computing, data communications, software design, systems programming, and theoretical foundations. Students may choose to pursue either a thesis or capstone track. The thesis option requires four electives and three thesis-related courses, while learners who select the capstone track take five electives and a required web development course. The application process for this program is unique. Prior to applying, prospective students should register for the theoretical foundations course and either systems programming or web application development. They are then asked to submit an application during the semester in which they are enrolled in the second course. Those who complete both courses with a cumulative GPA of 3.0 or higher are admitted to the program. Prospective students should possess an undergraduate degree with a background in discrete mathematics and object-oriented programming using the C++ or Java programming languages, and must successfully pass an online test of critical reading and writing skills. All students pay the same tuition, regardless of their state of residence. Harvard University receives regional accreditation from The New England Association of Schools and Colleges' Commission on Institutions of Higher Education. University of Minnesota Twin Cities ranks #5 on The 50 Best Online Master's in Engineering Programs! Offered through its Minneapolis Twin Cities campus, the University of Minnesota's online master of science in electrical engineering program prepares students to take on challenging roles in numerous industries. Graduates of the fully online engineering master's program have gone on to find employment with companies and organizations such as Boeing, Lockheed Martin, and NASA. The 30-credit curriculum introduces foundational concepts in solid-state electronics, surface and plasma physics, automation, power systems, and communications systems and theory. Degree candidates may choose between thesis or coursework-only tracks. Thesis students take 20 academic and 10 thesis-related credits before completing an oral final examination. Those who choose the coursework-only option complete 30 academic credits, and must perform independent research, write a report, and give an oral presentation on their findings. Both options feature a built-in, six-credit minor outside of the engineering department. Course delivery is usually asynchronous, although some professors require synchronous log-ins for quizzes, presentations, or examinations. Applicants must have an undergraduate GPA of 3.40 or higher and a background in engineering, science, physics, or mathematics. Prospective students should also submit GRE scores, unless they previously earned a bachelor's degree in engineering from the University of Minnesota with a GPA of 3.4 or higher. Enrollment is available only in the fall. Minnesota residents pay discounted tuition. University of Minnesota receives regional accreditation from the Higher Learning Commission of the North Central Association of Colleges and Schools. University of Illinois at Urbana-Champaign ranks #6 on The 50 Best Online Master's in Engineering Programs! With four customizable online master's engineering programs to choose from, University of Illinois students can explore personal fields of interest as they earn an MS in aerospace engineering, civil and environmental engineering, or mechanical engineering, or an M. Eng. in bioengineering. Through a unique combination of core and elective coursework, students build skill in key areas while gaining specialized knowledge related to their own interests. All programs are cohort-based, and, with the exception of the 36-credit civil engineering degree, consist of 32 credit hours. Civil and environmental engineering students may choose a concentration in construction materials, environmental engineering, environmental hydrology and hydraulic engineering, geotechnical engineering, or structural engineering. The bioengineering curriculum features concentrations in bioinstrumentation and computational genomics, and aerospace engineering students have nine specializations to choose from. Completion times vary considerably between programs. Applicants must hold a BS in a related discipline granted by a regionally accredited institution. While the mechanical engineering program requires an undergraduate GPA of at least 3.25 for the last 60 semester hours or last 90 quarter hours, the other programs require an undergraduate GPA of at least 3.0. Prospective students should also submit official transcripts, a 500-word personal statement, current resume, proof of finances, and three letters of recommendation. Applicants to the bioengineering program are not required to provide GRE scores. Illinois residents who enroll in the mechanical engineering program receive a tuition discount. Tuition for the other three programs is identical for in-state and out-of-state students. University of Illinois at Urbana-Champaign receives regional accreditation from the Higher Learning Commission. University of Southern California ranks #7 on The 50 Best Online Master's in Engineering Programs! Based in Los Angeles, USC offers several engineering master's programs online. Students may earn an MS in aerospace, astronautical, biomedical, chemical, materials, petroleum, or electrical engineering, as well as an MS in systems architecting and engineering. All programs are offered on a full- or part-time basis. Part-time students typically earn their degrees in three to four years, and full-time students usually complete the program in two to three years. Each curriculum consists of at least 27 credits, and includes a mixture of core and elective courses. Instruction occurs entirely online, in a unique format that blends the virtual classroom with live, on-campus courses. Students must maintain a cumulative GPA of at least 3.0 in order to graduate. Prospective students must hold a bachelor's degree in a related discipline. They must also demonstrate sufficient prerequisite coursework. Applicants should submit official transcripts and GRE scores. While the university does not specify a target GPA, it favors applicants with strong academic records. Along with an application, prospective students should include a resume and two academic or professional letters of recommendation. A personal statement is not required but encouraged. In-state and out-of-state students pay the same per-credit tuition rate. USC receives regional accreditation from the Western Association of Schools and Colleges. North Carolina State University ranks #8 on The 50 Best Online Master's in Engineering Programs! Employed professionals seeking a convenient alternative to traditional research-based graduate programs may find that North Carolina State University at Raleigh's master's programs are just what they're looking for. Distance learners can pursue an aerospace engineering or biological and agricultural engineering master's online. Both 30-credit programs are delivered in a flexible asynchronous format, and the aerospace program can be completed in just one year of part-time study. While program guidelines are set to keep students on track, the course sequence is highly flexible. Aerospace students select from 16 courses, including principles of structural vibration, engineering design optimization, and wing theory. Biological and agricultural students choose from 14 courses such as agricultural waste management, precision agriculture technology, and special problems in the field. Prerequisite courses are required, and vary between programs. Prospective students must hold a BS from an accredited institution with a cumulative GPA of at least 2.8 and major GPA of at least 3.0. Those applying to the biological and agricultural program should provide GRE scores, and all applicants must include official transcripts, a statement of purpose, and letters of reference. Enrollment takes place in fall and spring. North Carolina residents pay discounted tuition. North Carolina State University at Raleigh receives regional accreditation from the Southern Association of Colleges and Schools Commission on Colleges. University of California - Los Angeles ranks #9 on The 50 Best Online Master's in Engineering Programs! UCLA's 36-unit, nine-course MS in engineering has earned a reputation as one of the country's best online master's in engineering. Exploring data science, environmental and water resources, engineering management, mechanics of structures, and systems engineering, the degree typically takes seven quarters and two summer terms to complete. The program culminates in a four-unit capstone course that includes extra readings, a project, and written report. In lieu of the capstone project, students may answer three additional final exam questions for the last three courses of the program, or, with faculty approval, compose a thesis. Enrollment takes place in fall and spring. Applicants must hold a bachelor's degree from a regionally accredited institution and submit official transcripts demonstrating a GPA of at least 3.0 for the last 60 semester hours or last 90 quarters hours completed. Students should also provide GRE scores, a personal statement, and three letters of recommendation; at least one of which must be from a current or former employer. All students pay the same per-credit tuition rate, regardless of their state of residence. Financial aid is available to qualified applicants. UCLA receives regional accreditation from the WASC Senior College and University Commission. Stevens Institute of Technology ranks #10 on The 50 Best Online Master's in Engineering Programs! Located in Hoboken, New Jersey, Stevens Institute of Technology offers a comprehensive engineering master's online that may be pursued on a full-time or part-time basis. With no on-campus requirements, Stevens' master's in computer engineering presents a convenient opportunity to earn a degree in this rapidly-growing field. The program's versatile curriculum explores the cutting-edge technology and skills behind video game and visual environment design, network systems construction, advanced computation and medical information systems development, and creating bio-inspired algorithms for advanced technology. Students select three core courses out of more than 20 options before choosing a concentration. Available concentrations include communications and signal processing and networks and security, and consist of three elective courses. Students may complete an optional thesis prior to graduation, and earn up to nine credits in an unrelated discipline. All instructors are industry professionals with years of field experience. Prospective students must possess a bachelor's degree in electrical or computer engineering, with an undergraduate GPA of at least 3.0. While Stevens accepts applicants who hold bachelor's degrees in engineering, physics, and mathematics, these students must complete additional prerequisite courses before starting the master's program. GRE scores are required. In-state and out-of-state students are charged the same tuition rate. Stevens Institute of Technology receives regional accreditation from the Middle States Commission on Higher Education. Purdue University ranks #11 on The 50 Best Online Master's in Engineering Programs! Students looking for an exceptional master of science in engineering online program will find four of them at Indiana's Purdue University. Along with a multidisciplinary master's in engineering program, the university offers entirely web-based opportunities to earn an MS in industrial engineering, mechanical engineering, or electrical and computer engineering. Each 30-credit program is self-paced, allowing students to complete coursework at their convenience. To foster a healthy work-study-life balance, Purdue students typically begin each program by taking just one class, and may pause their studies for a semester, if necessary. All distance learners are paired with an academic advisor, who helps to develop an appropriate degree plan and ensure program completion. Prospective students must hold a bachelor's degree from a regionally accredited college or university, with an undergraduate GPA of at least 3.25. Along with a 500-word personal statement, three letters of recommendation, a professional resume, and general GRE scores, applicants should submit two copies of their official transcripts. Enrollment occurs in fall and spring. Indiana residents receive a nominal tuition discount, but all students who file a FAFSA are eligible to receive financial aid. Purdue University receives regional accreditation from the Higher Learning Commission of the North Central Association of Colleges and Schools. University of Central Florida ranks #12 on The 50 Best Online Master's in Engineering Programs! Offering a broad range of web-based graduate programs, this Orlando institution is known as a leading provider of quality distance education. UCF's five online engineering degree master's programs allow students to earn an MS in aerospace engineering, engineering management, industrial engineering, materials science and engineering, or mechanical engineering. Each program consists of at least 30 credits, half of which include required core courses, and all five curricula include an optional thesis component. Students develop individual academic plans with the help of an advisor. While specific application requirements vary according to program, all UCF applicants must hold a bachelor's degree from a regionally accredited institution and submit their official transcripts. In addition, applicants to the aerospace engineering, industrial engineering, and materials science programs should have a bachelor's degree in a related field such as aerospace, computer science, engineering, or mathematics. Prospective materials science majors who do not hold a related bachelor's degree may complete prerequisite courses in differential equations, experimental techniques in mechanics and materials, mechanics of materials, structure and properties of materials, and thermodynamics at UCF, prior to starting the graduate program. GRE scores are required, along with a personal statement, professional resume, three letters of recommendation, a residency form, and an immunization form that can be downloaded from the admissions website. Candidates may apply in fall, spring, or summer. Florida residents receive a tuition discount. UCF receives regional accreditation from the Southern Association of Colleges and Schools Commission on Colleges. Virginia Polytechnic Institute and State University ranks #13 on The 50 Best Online Master's in Engineering Programs! Commonly known as Virginia Tech, Virginia Polytechnic Institute and State University enjoys a reputation for its innovative academic programs and cutting-edge research. Its distance education division offers two rigorous online master's in engineering degrees in aerospace engineering and ocean engineering. Both 30-credit programs include 12 credits, or four classes, of core courses. After completing these, students may then choose from over a dozen electives in their area of specialization. The aerospace program focuses primarily on concepts in aerodynamics, flight mechanics, propulsion, and structures, while students in the ocean engineering program gain a working knowledge of naval vessel design. While both programs include a thesis option, students who choose not to write a thesis must instead complete a final research report. Both programs conclude with a comprehensive oral examination. All courses are delivered in a mixture of synchronous and asynchronous formats. Synchronous class sessions are limited to a one-hour live discussion per week, in which students interact with their professors and classmates. Most learners take one or two classes per semester, and ultimately complete the program in three or four years. Applicants should hold a bachelor's degree from a regionally accredited institution, with an undergraduate GPA of at least 3.0. They must also provide official transcripts, GRE scores, a personal statement, resume, and letters of recommendation. Both programs award transfer credit toward up to 50% of the plan of study. Virginia residents receive a tuition discount. Virginia Tech receives regional accreditation from the Commission on Colleges of the Southern Association of Colleges and Schools. Pennsylvania State University ranks #14 on The 50 Best Online Master's in Engineering Programs! With five online master's engineering degrees to choose from, prospective Penn State students who can't make it to the school's University Park campus can still earn an MS in electrical or software engineering, or an M. Eng. in nuclear, systems, or software engineering. Each program is between 30 and 36 credits in length, and all are presented entirely online. While students pursuing a degree in mechanical engineering or electrical engineering may enhance their core curriculum through multiple electives, the other three programs are preplanned and do not include study outside of the main subject field. Specific course details, lengths, and delivery methods vary by program, with some dividing semesters into seven-week-long terms. Students typically take two or three courses per semester, earning a degree in two years or six consecutive semesters. Applicants must have earned an engineering-related bachelor's degree from a regionally accredited and ABET accredited institution. Penn State heavily weighs undergraduate coursework, as well as applicants' official transcripts. Candidates must have a GPA of at least 3.0 for the last two years of undergraduate study, in addition to GRE scores of 4.0 or higher on the analytical writing section. Prospective students must also submit a professional resume, one-to-two-page statement of purpose and interest in Penn State's program, and three professional references. Penn State receives regional accreditation from the Middle States Commission on Higher Education. Columbia University ranks #15 on The 50 Best Online Master's in Engineering Programs! Based in New York City, Columbia University is home to the prestigious Fu Foundation School of Engineering and Applied Science. Columbia Video Network, the school's online division, offers several challenging online master's in engineering degrees that allow students to earn an MS in Applied Mathematics, Applied Physics, Biomedical, Chemical, Civil, Computer Science, Earth and Environmental, Electrical, Industrial Engineering, Materials Science, Mechanical, Methods in Finance, and Systems Engineering. Columbia Video Network also offers doctoral degree programs in Computer Science, Earth and Environmental, Electrical, and Mechanical Engineering. In and out-of-state students pay tuition on a per-credit basis, making Columbia's programs economical as well as academically rigorous. All programs consist of 30 credit hours and feature a mix of core and elective courses delivered entirely online. While specific credit distributions vary by program, but include between nine and 15 credits of core coursework. Some programs, such as biomedical engineering, allow students to select their core courses while others, including materials science, are built around a prescribed core sequence. Columbia University in the City of New York receives regional accreditation from the Middle States Commission on Higher Education. University of Wisconsin - Madison ranks #16 on The 50 Best Online Master's in Engineering Programs! Over the last few years, the University of Wisconsin-Madison has received extensive recognition for its innovative, interactive online degree options, including its six online engineering master's programs. Distance learners can pursue an M. Eng. in engine systems, engineering management, manufacturing systems engineering, sustainable systems engineering, or mechanical engineering and polymer science, as well as an MS electrical engineering, without setting foot in Wisconsin. All six programs consist of 30 credits, and include live online discussions with professors and peers. All curricula incorporate workplace research projects as a method of developing hands-on skills. Weekly assignments, such as readings and projects, may be completed whenever convenient, provided that students meet designated deadlines, and most students spend between 10 and 18 hours per week on coursework. While completion times differ from program to program, most students are able to earn their degree in two to four years. All distance learners pay the same-per credit rate regardless of state residency. Applicants must hold an ABET-accredited bachelor of science degree in a related discipline. Official transcripts must demonstrate a GPA of at least 3.0 for the last 60 semester hours of undergraduate study. Candidates who do not hold an ABET-accredited degree can gain admission by demonstrating sufficient prerequisite coursework in engineering, mathematics, or science, or through professional experience. Engineering management program applicants must have at least two years of professional experience. No pre-graduate examination scores are required for admission. University of Wisconsin-Madison receives regional accreditation from the Higher Learning Commission of the North Central Association of Colleges and Schools. University of Nebraska Lincoln ranks #17 on The 50 Best Online Master's in Engineering Programs! For students interested in the business aspects of engineering, the University of Nebraska-Lincoln offers a fully online engineering master's program in engineering management. Consisting of 30 credit hours, the non-thesis curriculum includes a required nine-credit, three-course minor and an optional specialization in construction engineering and management. The program also includes six credits of engineering electives and nine credits of MBA courses. Students receive a broad technical education that does not prepare them for doctoral-level work, but does instill a range of widely-applicable skills. Online courses are presented in eight-week-long accelerated sessions. While new students may enroll in fall, spring, or summer, financial aid is available only to those who enroll in fall or spring. Candidates must hold a bachelor's degree in engineering and technology, physical science, computer science or mathematics, with a GPA of at least 3.0. The university admits prospective students who hold a bachelor's degree in other discipline at its discretion, but these students usually must complete undergraduate coursework in engineering science before starting the master of science in engineering online. Two years of professional experience are recommended for all applicants. Prospective students should upload their official transcripts to the university's admissions website. GRE or GMAT scores are not required, but are highly recommended. Applicants must also submit a personal statement of professional goals, two letters of recommendation, and a professional resume. If applicable, they must demonstrate English proficiency. All online students pay a flat tuition rate. University of Nebraska-Lincoln receives regional accreditation from the Higher Learning Commission of the North Central Association of Colleges and Schools. University of Washington ranks #18 on The 50 Best Online Master's in Engineering Programs! The University of Washington's web-based graduate programs include several online master's in engineering degrees. Created with part-time, working students in mind, each is presented in a synchronous format and delivered entirely online. Students may pursue an MS in civil or mechanical engineering, or an ME in aerospace engineering or pharmaceutical bioengineering. Degree candidates in the aerospace and pharmaceutical bioengineering programs gain core competencies in the field as they pursue specialized academic concentrations. Aerospace students may choose to specialize in composites, controls, fluids, or structures, while the pharmaceutical curriculum offers 10-credit tracks in drug discovery and design and translation pharmaceutics track. While each program differs in duration, most students graduate in one to four years. Prospective students must hold a bachelor's degree in a related field, or sufficient undergraduate coursework in engineering or mathematics, and a GPA of at least 3.0. Additional application requirements include GRE scores, a statement of purpose, resume, and three letters of recommendation. Enrollment dates vary by program, but are generally limited to fall or spring. Tuition is identical for Washington residents and out-of-state students. University of Washington receives regional accreditation from the Northwest Commission on Colleges and Universities. Worcester Polytechnic Institute ranks #19 on The 50 Best Online Master's in Engineering Programs! Worcester Polytechnic Institute is a private school located in Worcester, Massachusetts that focuses on the applied sciences and technical arts. WPI offers eight engineering master's programs and several engineering certificates to online learners. Online students can pursue master's degrees in biomedical engineering, electrical and computer engineering, environmental engineering, fire protection engineering, mechanical engineering, power systems engineering, robotics engineering, and systems engineering. Designed for working professionals, WPI's engineering programs involve a high level of group work to equip students with practical engineering experience. Students complete group projects using the same online tools used for coursework. Delivered asynchronously, students can access courses and view lectures at their convenience. Most master's students complete their degree in three to five years of part-time study. Admission to WPI's engineering programs requires a related bachelor's degree, generally from an institution accredited by the Accreditation Board for Engineering and Technology. Graduate students can take up to two courses before formal admission to a program. Online engineering students at WPI benefit from a variety of special services, such as an individually-assigned advisor who helps the student succeed academically. Distance learners also have access to a career development center, library services, disability services, and technical support and discounts. Worcester Polytechnic Institute receives regional accreditation from the New England Association of Schools and Colleges. Lehigh University ranks #20 on The 50 Best Online Master's in Engineering Programs! Lehigh University offers a master's of science in engineering online in seven different fields: biological chemical engineering, chemical engineering, chemical energy engineering, healthcare systems engineering, management science and engineering, mechanical engineering, and polymer science and engineering. Lehigh is a private research university located in Bethlehem, Pennsylvania. Students in Lehigh's online programs choose between two learning platforms for coursework. Classroom Online is an asynchronous program that gives students maximum scheduling flexibility. Classroom Live is a synchronous option that lets distance learners interact with fellow students and instructors online in real time. Students must earn 30 credit hours to graduate with a master's in engineering from Lehigh, with at least 18 credits at the 400 course level. Admissions criteria varies depending on the engineering program, but Lehigh generally requires applicants to have a minimum 3.0 GPA and to have completed desired prerequisite courses. Students with an undergraduate degree in a different field from their chosen master's program may need to take additional prerequisite courses, which do not count towards the degree. Distance learners enrolled in a Lehigh engineering master's program can transfer up to nine previously earned graduate credits towards degree completion. Lehigh University receives regional accreditation from the Middle States Commission on Higher Education. Lehigh's engineering master's programs also have accreditation from the Engineering Accreditation Commission of the Accreditation Board for Engineering and Technology (ABET). University of Alabama ranks among The 50 Best Online Master's in Engineering Programs! The University of Alabama's MS in aerospace engineering and mechanics may be of interest to students looking for engineering master's programs online. UA's College of Engineering dates to 1837 and is one of the five oldest engineering schools in the United States. Its alumni network includes top executives at NASA and Lockheed Martin. Graduates excel in a variety of industries involved in building and designing systems for national defense, missiles, and aircrafts. The 30-credit hour master's of science in aerospace engineering and mechanics is available entirely online. Curriculum includes core courses, such as orbital mechanics, theory of elasticity, and advanced dynamics of flight. Distance learners complete six core credits, six mathematic credits, and either 12 or 18 elective credits, depending on if they choose the thesis or non-thesis track. Students who choose the thesis option enroll in six credit hours of thesis research, write a thesis, and defend it in front of a thesis committee. Students choosing the non-thesis option enroll in an additional six elective credits. Up to 12 graduate credits may transfer towards a UA graduate degree. Transfer credit is only applicable if earned no longer than six years prior to the student's graduation date. Only six hours of credit will be accepted from the US Air Force's Test Pilot School. The University of Alabama receives regional accreditation from the Commission on Colleges of the Southern Association of Colleges and Schools. Ohio State University, Ohio State Online ranks among The 50 Best Online Master's in Engineering Programs! Ohio State University - Main Campus in Columbus, Ohio, offers distance learners two master's of science in engineering online degrees: a master's of global engineering leadership and a master's of science in welding engineering. Both degrees are available entirely online through OSU's College of Engineering. Students in the master's of global engineering leadership program usually complete their 33-credit degree in 12 to 28 months. Curriculum includes courses, such as project management and financial and managerial accounting for engineers. OSU faculty experts from the Fisher College of Business and John Glenn College of Public Affairs teach management courses. Students end the program with a five-credit integrative project that explores a real or hypothetical engineering problem. The master's of science in welding engineering suits individuals working as welding engineers or in related welding positions who want to advance their careers in the welding engineering field. The program takes place entirely online, with more than 20 welding engineering graduate courses available for distance learners. Courses offered include resisting welding processes, brazing and soldering, and molten metal processing. Ohio State University - Main Campus receives regional accreditation from the Higher Learning Commission (HLC). The master's of science in welding engineering program at OSU is accredited by the Engineering Accreditation Commission of the Accreditation Board for Engineering and Technology (ABET). Rutgers University ranks among The 50 Best Online Master's in Engineering Programs! Rutgers University - New Brunswick is the oldest campus of the prestigious public research university and is located in New Brunswick, New Jersey. Its master's of engineering in biomedical engineering is an excellent choice for individuals looking to complete their engineering master's online. The biomedical engineering master's degree can be completed entirely from a distance, allowing students the flexibility to set their own schedules. The online program's commitment to small class size makes it easy for learners to interact with instructors and fellow classmates. Students can attend part-time or full-time, year-round, with program start dates in fall, spring, or summer. All distance learners receive enrollment and executive coaching to ensure academic success. Online coaches help students with issues like time management, academic study habits, stress reduction, and connecting to other valuable online resources. The application process requires prospective students to submit official transcripts, official GRE scores, a personal statement, and three letters of recommendation. Instructors in the program include leading researchers in biomaterials engineering, neurotechnology, molecular bioengineering, and more. Designed for working professional engineers, the program includes a broad overview of quantitative biomedical engineering. The curriculum explores six important areas within the field, including computational bioengineering and biomedical imaging, biomaterials and tissue engineering, and physiological systems and bioinstrumentation. Interested students have the opportunity to complete one-on-one independent study research with a faculty member. Rutgers University - New Brunswick receives regional accreditation from the Commission on Higher Education of the Middle States Association of Colleges and Schools. University of Arkansas ranks among The 50 Best Online Master's in Engineering Programs! The University of Arkansas in Fayetteville, Arkansas offers three options for distance learners seeking a master's of science in engineering online. Students can pursue a general master's of science in engineering or take a more specialized route and earn a master's of science in electrical engineering or a master's of science in engineering management. U of A's College of Engineering offers all three of the programs in eight-week sessions, five times each year. The engineering MS suits students with an undergraduate degree in engineering who have an interest in taking a wide variety of engineering courses throughout their master's studies. Explored topics in the general engineering program include civil, electrical, environmental, mechanical, and transportation engineering. Students take courses, such as structural dynamics, fundamentals of sustainability in civil engineering and nonlinear programming. The MS in electrical engineering program includes an emphasis in electric power engineering and addresses issues like power system control, electric power quality, and advanced distribution systems. Students need a minimum 3.0 GPA and a GRE quantitative and verbal combined score of at least 302 for admission. Courses available include power system operation and control, wireless communications, and introduction to simulation. The MS in engineering management gives engineers the business and management skills necessary to advance to leadership positions. Applicants need a bachelor's in engineering, and core requirements include project management, economic decision making, and introduction to engineering management. The University of Arkansas receives regional accreditation from the Higher Learning Commission (HLC). Texas Tech University ranks among The 50 Best Online Master's in Engineering Programs! Texas Tech University's four engineering master's online degrees include a master's of engineering, a master's of engineering in healthcare engineering, a master's of science in software engineering, and a master's of science in systems and engineering management. Located in Lubbock, Texas, TTU is a public research university that opened in 1923. The Edward E. Whitacre Jr. College of Engineering offers the generalized master's of engineering degree. The 36-credit degree takes place entirely online and lets students explore several different fields of engineering, including industrial and software engineering. The degree does not require students to complete a thesis. Admittance to the program requires a bachelor's degree in engineering. The Whitacre College of Engineering also offers the master's of engineering in healthcare engineering, which focuses on preparing graduates to use the principles of engineering to support services in healthcare facilities. The 36-credit program includes 11 courses and a three-credit research experience. The interdisciplinary curriculum focuses on topics like biotransport, bioengineering, and healthcare delivery systems. The MS in systems and engineering management requires 30 credits to complete and has both a thesis and a non-thesis option. Some classes for this degree require students to use interactive video conferencing. The master's of science in software engineering is a 36-credit, non-thesis degree completed entirely online through the Department of Computer Science. Students take courses, such as software verification and validation, fault-tolerant computer systems, and systems theory. Texas Tech University receives regional accreditation from the Southern Association of Colleges and Schools Commission on Colleges. Carnegie Mellon University ranks among The 50 Best Online Master's in Engineering Programs! Carnegie Mellon University's Institute for Software Research in Pittsburgh, Pennsylvania, offers a master's of science in engineering online program entirely online. Online students watch streaming lectures through an online platform. They also receive access to lecture slides and notes, readings, and a course website. The lectures are also available to download as podcasts. Students get the chance to interact with their instructors via bulletin board, email, chatroom, and video-teleconferencing. Distance learners can enroll in the program part-time or full-time but must complete the degree within six years. Admission to Carnegie Mellon's software engineering program is competitive. The admissions committee looks for prospective students with a strong undergraduate background in computer science or a related field, one to two years experience in the software industry, and a demonstrated ability to succeed at the graduate level. Students can take up to three full-semester courses prior to being formally admitted to the program. Distance learners take courses that include software development studio, analysis of software architects, and managing software development. They can also arrange an independent study in order to pursue a specific academic interest in-depth or work with a small group through an independent study project. At the end of the program, all MSIT-SE distance learners must complete a capstone project. Carnegie Mellon University receives regional accreditation from the Middle States Commission on Higher Education (MSCHE). Cornell University ranks among The 50 Best Online Master's in Engineering Programs! An online master's engineering degree is available from Cornell University's College of Engineering in Ithaca, New York through a part-time, self-paced program that offers coursework year-round. Students enrolled part-time can finish the program in as little as two years, while students opting to take classes full-time can complete the degree in one year. Students must successfully finish 30 credit hours in order to graduate with the ME in systems engineering from Cornell, and at least six credits must consist of a faculty-supervised systems engineering team project. Although the majority of the degree takes place online, there are two in-person modules: systems engineering management for virtual team and creativity/innovation in systems engineering. Other courses in the distance program explore issues like project leadership, search engine optimization, and risk analysis. Admissions criteria includes a bachelor's degree in engineering, science, or mathematics from an accredited university or college, two letters of recommendation, GRE scores, and one year of relevant, documented work experience. In some cases, the GRE may be waived. Prerequisites needed for admission include the following math classes: linear algebra, differential equations, differential calculus, and integral calculus. To graduate with the master's of engineering, students also need to complete an undergraduate probability and statistics course. If they have not yet fulfilled this requirement upon admission into the program, it can be taken on campus at Cornell or at another university. Cornell University receives regional accreditation from the Middle States Commission on Higher Education. Oregon State University ranks among The 50 Best Online Master's in Engineering Programs! Oregon State University's master of science in engineering online degree not only benefits engineering professionals, but also those with a broad background in science, technology, and mathematics. Taking a broad perspective, the program combines technical engineering expertise with broad business knowledge, including financial and management skills. OSU's master's of engineering in industrial engineering can be completed entirely online, allowing students to continue living in their own communities, working in their current jobs, and maintaining family responsibilities. The same faculty that develops the on-campus curriculum helped create the online program, and online instructors remain closely involved in the engineering industry. To graduate, students earn 45 credits by taking 12 courses in topics, such as advanced engineering economic analysis, legal aspects of engineering, and product development. Students who live near the OSU campus in Corvallis have the option to take up to 15 credits of elective courses in person, with advisor approval. Distance learners who choose this option will need to pay on-campus tuition for those credits. Students who take two courses per term will graduate in about two years, while full-time students can graduate in half that time. Before entering the program, students need to complete prerequisite coursework in differential and integral calculus, probability and statistics, and matrix algebra. Oregon State University receives regional accreditation from the Northwest Commission on Colleges and Universities (NWCCU). Texas A&M University ranks among The 50 Best Online Master's in Engineering Programs! Texas A&M University - College Station's College of Engineering offers a wide selection of online master's in engineering degrees. This includes master's of engineering degrees in general engineering, computer engineering, aerospace engineering, electrical engineering, mechanical engineering, industrial engineering, and petroleum engineering. Also available are two master's of science degrees: safety engineering and engineering systems management. Finally, distance students can pursue a master's of engineering technical management. Program requirements vary by degree, but most take about 30 credits to graduate and include a final project or internship component. Admissions criteria also varies based on the individual program, but Texas A&M's College of Engineering generally considers an applicant's undergraduate background and GPA, GRE scores, and professional work experience. Admissions committees take into account an applicant's documented ability to complete the graduate program in question and the strength of an applicant's statement of purpose. The master's of engineering in technical management is a 21-month, entirely online degree designed for working engineering professionals who want to move up in their careers. The program focuses on giving students a basic understanding of business skills that they can use in combination with engineering technical knowledge, such as project management, leadership, and new product development. Services for online engineering students include bookstore and library access, 24/7 technical assistance through Texas A&M's Help Desk Central, counseling, disability services, veteran's resources, and assistance from the university writing center. Texas A&M University - College Station receives regional accreditation from the Southern Association of Colleges and Schools Commission on Colleges. University of Cincinnati ranks among The 50 Best Online Master's in Engineering Programs! One of the 50 largest universities in the U.S., the University of Cincinnati - Main Campus is a public research university located in Cincinnati, Ohio. UC offers distance students two online engineering master's degrees: a master's of engineering in mechanical engineering and a master's of engineering in electrical engineering. The programs combine business and technical knowledge, giving graduates the practical skills needed to advance their careers. The MEng in mechanical engineering and the MEng in electrical engineering both require 30 credit hours for completion and take about 18 months of study. The electrical engineering program helps students understand advanced microsystems, embedded systems technology, and leadership within the field. The career-focused, practical degree is not research-intensive and does not require a thesis. Faculty members have extensive experience within the industry to help students understand the problems they will face within their careers. Coursework is accelerated, with students enrolling in seven-week terms. Classes cover topics like embedded systems, intelligent systems theory, and electromagnetic energy conversion. The mechanical engineering degree is both industry- and practice-focused, combining business skills with manufacturing and design knowledge. Like the electrical engineering degree, the mechanical engineering program does not require a thesis or extensive research, instead focusing on practical skill development. Students take courses in supply chain management, quality control, and occupational safety engineering, and end the program with a capstone. Admission to the program requires a bachelor's degree from an ABET-accredited program, with a minimum 3.0 GPA. Applicants do not need GRE scores unless they do not meet the aforementioned admissions requirement. The University of Cincinnati - Main Campus receives regional accreditation from the Higher Learning Commission. University of Dayton ranks among The 50 Best Online Master's in Engineering Programs! Distance learners can complete an online engineering degree master's at the University of Dayton in Ohio. A private, Roman Catholic university, UD enrolls more than 11,000 undergraduate and graduate students each year. UD's Department of Engineering Management, Systems, and Technology offers a master's of science in engineering management. Students in the engineering management program learn how to analyze data, create models, and make engineering decisions through coursework in operations research and statistics. The program prepares graduates for leadership roles in engineering across diverse industries, including government, the military, and business. To graduate from the program distance learners need to complete 36 credit hours. Courses available include engineering economy, decision analysis, and advanced engineering design. Students can choose to take a special project in engineering management as one of their electives. Concentrations available include manufacturing, artificial intelligence, operations research, Six Sigma quality, reliability engineering, simulation, and systems engineering. Individuals pursuing the MS in engineering management also have the opportunity to specialize in an area beyond their concentration, by earning one of the following graduate certificates at the same time: design of experiments, Six Sigma, or systems engineering. The design of experiments certificate gives students the skills to solve problems related to product design and experimentation. The Six Sigma certificate provides students with a thorough understanding of statistical concepts using Six Sigma. The certificate in engineering systems ensures students can create successful systems. The University of Dayton receives regional accreditation from the Higher Learning Commission (HLC). Northeastern University ranks among The 50 Best Online Master's in Engineering Programs! The interdisciplinary online master's in engineeringat Northeastern University Global Network combines the varied fields of engineering, business, and technology. Northeastern is a private research university located in Boston, Massachusetts with a history that dates back to 1898. The engineering management program suits professional engineers who want to manage technology-based programs. However, students from other backgrounds are accepted on a case-by-case basis. Northeastern's engineering degree prepares students for leadership positions or to work on engineering teams and effectively tackle a range of problems within the field. Northeastern's College of Engineering offers distance learners the chance to pursue its master's of science engineering management entirely online, with no on-campus requirements. The 32-credit program includes courses, such as deterministic operations research, mass customization, human factors engineering, and environmental protection and management. Full-time students generally complete the MS in two years. Skills gained through the program include leadership techniques, engineering fundamentals, and business theories needed to succeed in engineering. Graduates may find work as project managers, product developers and managers, and supply chain managers. To be admitted to the engineering management master's program, applicants need to have an undergraduate degree from an accredited college or university, two letters of recommendation, a statement of purpose, a resume, and GRE scores. The GRE requirement may be waived in some cases but is generally required of most candidates. Northeastern University Global Network receives regional accreditation from the New England Association of Schools and Colleges, Inc. (NEASC). Georgia Institute of Technology ranks among The 50 Best Online Master's in Engineering Programs! Located in Atlanta, Georgia, Georgia Institute of Technology - Main Campus is a public research university focused on science and technology. Students looking for an online engineering master's program will find numerous options for pursuing an MS in engineering. The school offers distance graduate degrees in aerospace engineering, computational science and engineering, electrical and computer engineering, industrial engineering, and mechanical engineering. All of the engineering programs at Georgia Tech collaborate with industry leaders to create curriculum that ensures students succeed in today's engineering field. Courses include lectures recorded on campus in Atlanta, which distance students can either stream online or download to view at a later time. Admissions criteria and graduation requirements vary based on each engineering degree. The 33-credit, multidisciplinary aerospace engineering MS includes a master's or non-master's option, and students need a minimum 2.7 GPA in order to graduate. Students work closely with their advisors to design a course of study within the degree's six research disciplines, which includes flight mechanics and control and propulsion and combustion. The 30-credit computational science and engineering degree includes a group of core computational science and engineering courses while also allowing students to individualize the program to fit their own career goals and research interests. Georgia Tech's online mechanical engineering degree focuses on new innovations in the field of mechanical engineering and helps students master the research process. Georgia Institute of Technology - Main Campus receives regional accreditation from the Southern Association of Colleges and Schools Commission on Colleges. Washington State University ranks among The 50 Best Online Master's in Engineering Programs! Washington State University in the town of Pullman offers two online master's in engineering degrees to distance learners: the master's of engineering in engineering and technology management and the professional science master's in electric power engineering. The interdisciplinary engineering and technology management master's requires completion of 30 credit hours. This includes 10 courses and one three-credit capstone or non-thesis case study project. Curriculum covers principles of engineering management and business principles related to technology. Courses available include contract project management, technical decision analysis, and quality improvement using design of experiments. Transfer students can receive credit for up to 50% of the program's required credits, while the remaining 50% must be taken through WSU's engineering and technology management graduate program. To be admitted to the program, students need a minimum 3.0 GPA, a bachelor's degree from an accredited college or university, a personal statement, three letters of recommendation, and a resume demonstrating professional experience. The 30-credit, two-year professional science master's in electric power engineering has a curriculum that combines technical electric power engineering fundamentals and management skills. WSU's Energy Systems Innovation Center of the School of Electrical Engineering and Computer Science offers the degree. The curriculum includes courses, such as renewable energy engineering, power system economics, and analysis of power systems. Students also take a three-credit internship. Prospective students with the best chance of being admitted to this program will have an undergraduate degree in electrical engineering. Washington State University receives regional accreditation from the Northwest Commission on Colleges and Universities (NWCCU). University of Arizona ranks among The 50 Best Online Master's in Engineering Programs! Distance learners seeking an online master's in engineering will find numerous options at the University of Arizona in Tucson. UA offers more than 80 degrees, all of which take place entirely online. Master's degrees in engineering available from UA online include: electrical and computer engineering, engineering management, industrial engineering, photonic communications engineering, and systems engineering. Different program requirements exist for each engineering degree at UA. However, generally speaking it takes one-and-a-half to two years of study to earn a master's degree in engineering. To be accepted into an engineering master's program at UA, applicants need a minimum 3.0 GPA and a bachelor's degree in engineering, or a related field, from a regionally accredited college or university. Students who do not meet the minimum 3.0 GPA requirement may be able to enroll as a non-degree seeking student initially and then apply for the program if their academic performance indicates success. Students can begin their engineering program in either the spring or the fall. Online engineering students at UA benefit from a variety of student resources designed specially for distance learners, including an individualized enrollment team to help them navigate the application and enrollment processes. Academic support specialists also help students succeed in each program. Other student services available for online students include free access to e-tutoring, one-on-one librarian consultations for research help, and access to an online leadership training program. A disability resource center, a UA career network, and academic skills coaching are also available. The University of Arizona receives regional accreditation from the Higher Learning Commission. University of Delaware ranks among The 50 Best Online Master's in Engineering Programs! The University of Delaware in Newark, Delaware offers an online engineering master's degree that can be completed in as little as two years. The MS in electrical and computer engineering stands out from other programs, as it provide learners with a broad understanding of the design of electrical and computer systems. This online program also teaches students how to ensure system security and apply practical theory. Graduates of this degree are able to develop engineering solutions that anticipate, protect from, and deal with cybersecurity threats. UD's faculty members in the engineering program come from diverse backgrounds that include both the corporate world and research. The 30-credit hour (10 course) online program is designed for individuals who hold a bachelor's degree in mechanical, computer, or electrical engineering, mathematics, or computer science. The curriculum covers concepts, such as advanced wireless communications, cyber security strategies, algorithm design, and information processing. Courses offered include modern machine learning, applied cryptography, and the smart grid. The program does not require students to complete a thesis. Courses last seven weeks, with sessions in the spring, summer, and fall each year. New students can begin the program in any term. The entire program can be completed online, but distance learners are welcome to participate in any on-campus activities if interested, including recruitment opportunities, career fairs, and graduation ceremonies. Tuition for the online MS in electrical and computer engineering is the same regardless of where students live. The University of Delaware receives regional accreditation from the Middle States Commission on Higher Education. The University of Tennessee ranks among The 50 Best Online Master's in Engineering Programs! Founded in Knoxville in 1794, UT offers a number of 30-credit, fully online master's in engineering programs, including programs in civil, environmental, industrial, and reliability and manageability engineering. UT offers ample research opportunities and resources, including hydraulics, biotechnology, water resources, and environmental engineering labs. Most of UT's online engineering master's programs offer one or two concentrations; however, reliability and management engineering students have six concentration options, which include nuclear engineering and electrical engineering. Students in any of UT's online engineering master's programs choose between thesis and non-thesis tracks. Learners access online courses through the Canvas learning management system. Courses include synchronous and asynchronous components, such as live discussions, exams, recorded lectures, and reading assignments. Some instructors require proctored tests. Students have access to job listings with major-specific recommendations. Applicants must have a bachelor's degree from a regionally accredited university and either a 2.7 cumulative GPA or a 3.0 GPA in senior undergraduate coursework. The University of Tennessee is regionally accredited by the Southern Association of Colleges and Schools (SACS). Case Western Reserve University ranks among The 50 Best Online Master's in Engineering Programs! Founded in 1826 in Cleveland, Ohio, CWRU offers distance learning programs designed for working professionals. The university's online master's in engineering has available concentrations in mechanical, biomechanical, and systems and control engineering. CWRU's school of engineering has produced many successful alumni, including Paul Bucheit, the creator of Gmail. CWRU's master's of science in engineering online programs require 27 to 30 credits, which students typically complete in one year. CWRU offers courses fully online. The core curricula explore topics including product and process design, business, and leadership and interpersonal skills. Students complete technical elective courses, such as biomedical engineering imaging, materials process and synthesis, and signal processing and communications. Students gain a foundation in technical knowledge and practical training in contemporary technology. CWRU delivers online courses primarily asynchronously through LEARN. Some courses include synchronous elements, such as live conferences. Each of the engineering programs culminates in an experiential learning capstone, during which teams of students work in simulated business environments. Transfer applicants may bring up to six previous credits. Applicants must have a bachelor's degree and at least a 3.0 GPA. Case Western Reserve University is regionally accredited by the Higher Learning Commission (HLC). Missouri University of Science and Technology ranks among The 50 Best Online Master's in Engineering Programs! Missouri S&T offers distance learning programs that provide practical skill sets. The university offers online master's in engineering degrees in fields including explosives, civil engineering, and manufacturing engineering. Missouri S&T's online master's in engineering programs meet the same high standards as its on-campus programs. Most online engineering programs require 30 credits, which students complete in one to three years. Students access courses asynchronously through the Canvas learning management system. Some courses may require synchronous elements, such as live video conferencing, and some instructors administer proctored exams. Though Missouri S&T imposes no residency requirement, some laboratory courses may involve in-person work. Many of the university's online engineering master's programs offer thesis and non-thesis options; however, some offer only a non-thesis format. The explosives engineering master's program features course topics including demolition of building and structures, environmental controls for blasting, and tunneling and underground construction techniques. The aerospace engineering master's curriculum includes courses in applied computational methods, heat transfer by convection, and advanced finite element analysis. Applicants must have a relevant bachelor's degree with a minimum cumulative GPA of 2.75. Missouri S&T students must maintain at least a 3.0 GPA. Missouri University of Science and Technology is regionally accredited by the Higher Learning Commission (HLC). Rochester Institute of Technology - RIT Online ranks among The 50 Best Online Master's in Engineering Programs! Founded in New York in 1829, RIT offers an online master's in product development that is ideal for working professionals who want to advance their careers. The program combines business and engineering coursework and helps students build their portfolios. Students can complete the 30-credit program on a full- or part-time basis, and most graduate in 16 months to four years. While earning their online engineering degree, master's students take courses in decision and risk benefit analysis, accounting for decision makers, and excellence in new product development. The program culminates in a capstone project; students demonstrate knowledge of product development during a corporate environment simulation. Students may complete the capstone individually or in teams. RIT delivers online courses primarily asynchronously through the myCourses learning management system. Some courses utilize synchronous elements, such as live conferences. Applicants must have a bachelor's degree from an accredited institution and at least a 3.0 cumulative GPA. RIT students must maintain a 3.0 GPA. Rochester Institute of Technology is regionally accredited by the Middle States Commission of Higher Education (MSCHE). University of South Florida ranks among The 50 Best Online Master's in Engineering Programs! Based in Tampa, USF is one of Florida's largest public universities. USF offers a number of online degrees and certificates, including an online master's in engineering management. USF offers the 30-credit program in accelerated and part-time formats. The program equips students with technical and management skills in areas such as quantitative care and workforce management care. The core curriculum includes topics such as principles of engineering management, management of technological change, and technology and finance. Students access online courses asynchronously through the Canvas learning management system. Students become familiar with the Canvas system during a self-paced course. Applicants must have a bachelor's degree in engineering from an accredited institution, a 3.0 GPA, and 156 and 146 quantitative and verbal GRE scores, respectively. USF may waive GRE requirements for students pursuing the program in an accelerated format. Students who do not possess at least two years of professional experience must complete an internship. USF students must maintain a minimum 3.0 GPA. University of South Florida is regionally accredited by the Southern Association of Colleges and Schools (SACS). George Mason University ranks among The 50 Best Online Master's in Engineering Programs! Founded in 1949 in Fairfax, Virginia, Mason offers pragmatic distance learning programs, including an online master's in systems engineering. The 30-credit program is designed for working professionals pursuing mid- to senior-level technical leadership positions. The core curriculum includes topics such as system management and evaluation, systems engineering principles, and system design and integration. Students access online courses through the Blackboard learning management system; instructors may deliver coursework asynchronously or synchronously. Students must choose a 12-credit concentration, such as systems engineering analysis or systems management. Students who pursue the architecture-based systems integration concentration earn a graduate certification in the field. The program culminates in a capstone research project. Virginia residents pay discounted tuition rates. Applicants must have a bachelor's degree in a relevant field, such as mathematics, physical science, engineering, economics, or computer science, and a minimum 3.0 cumulative GPA. Prerequisites include coursework in computer science and mathematics. Mason students must maintain a 3.0 GPA. George Mason University is regionally accredited by the Southern Association of Colleges and Schools (SACS). Colorado State University - Fort Collins ranks among The 50 Best Online Master's in Engineering Programs! Founded in 1870 in Fort Collins, CSU offers a number of online degrees at the undergraduate and graduate levels, including online master's degrees in engineering in fields such as biomedical, electrical, and computer engineering. Most of CSU's online engineering master's programs require 30 credits, which students complete within two years. Some courses are available in a hybrid format, and many programs, such as the electrical engineering program, allow students to choose between an ME and an MS. CSU's biomedical engineering program, designed with feedback from four colleges and thirteen departments, explores topics such as quantitative systems physiology, STEM communication, and generalized regression models. Systems engineering students take courses in software development methodology, engineering risk analysis, and cybersecurity for systems engineers. Students access online courses through the Canvas learning management system; instructors may deliver coursework asynchronously or synchronously. The university accepts transfer credits, but students must complete at least 21 credits through CSU. Students must maintain a 3.0 GPA. Colorado State University is regionally accredited by the Higher Learning Commission (HLC). Iowa State University ranks among The 50 Best Online Master's in Engineering Programs! Founded in Ames in 1858, ISU provides accessible distance and continuing education programs. The university offers several online engineering master's degrees in fields such as aerospace, energy systems, and industrial engineering. Engineering students complete at least 30 credits, 22 of which students must earn through ISU; however, mechanical engineering students may complete up to 15 credits outside ISU. Most students complete the fully online engineering master's programs in two years. The energy systems engineering master's program requires courses in advanced energy systems analysis and energy engineering economics and policy. Because not all courses are available every semester, students work with an advisor to plan their course schedule. Many of ISU's engineering programs allow students to choose between an MS program culminating in a research project and an ME program that requires more courses. Students access courses synchronously and asynchronously through the Blackboard learning management system. Applicants must have a bachelor's degree from an ABET-accredited institution and a 3.0 GPA. Prerequisites include certain math and physical science courses. ISU students must maintain a cumulative GPA of at least 3.0. Iowa State University is regionally accredited by the Higher Learning Commission (HLC). University of Idaho ranks among The 50 Best Online Master's in Engineering Programs! Founded in Moscow in 1889, U of I delivers innovative research and affordable distance education programs. U of I's online master's degrees in engineering include programs in civil, geological, and technology management engineering. The 30-credit engineering programs take two years to complete and are flexible enough for students with personal and professional obligations. Students access coursework asynchronously and synchronously through the Blackboard learning management system. Students in most of the university's engineering master's online programs choose between a research-oriented MS and an ME that requires more coursework. MS students with at least two years of work experience may pursue a non-thesis program track. The geological engineering curriculum covers topics including excavation and materials handling, rock mechanics, and erosion and sediment control. The technology management program includes coursework in enterprise accounting, leadership and organizational behavior, and accounting. Applicants must have either a bachelor's degree and a 3.0 GPA or five years of relevant work experience. U of I students must maintain a 3.0 GPA. The University of Idaho is regionally accredited by the Northwest Commission on Colleges and Universities (NWCCU). Drexel University ranks among The 50 Best Online Master's in Engineering Programs! Founded in Philadelphia in 1891, Drexel is nationally recognized for its co-operational education model. The university offers online master's in engineering degrees in fields such as electrical, systems, and software engineering. Drexel's online master's in engineering programs require 45 to 48 quarter credits. Ten-week semesters allow students to graduate within two years. Many programs include a nine-credit thesis project. The core curriculum for the software engineering program includes courses in software architecture, engineering and management, and security engineering. The systems engineering program requires coursework in integrated risk management, sustainment and integrated logistics, and systems engineering management. Some programs culminate in a department-approved capstone project involving individual research. Students complete coursework asynchronously through the Blackboard learning management system. Depending on the program, transfer students may apply up to 15 quarter credits toward their degree. Applicants must have earned a bachelor's degree in a math, physical science, computer, or engineering from an ABET-accredited institution with a minimum GPA of 3.0. Drexel students must maintain a 3.0 GPA. Drexel University is regionally accredited by the Middle States Commission of Higher Education (MSCHE). University of Illinois at Chicago ranks among The 50 Best Online Master's in Engineering Programs! Known for its large medical school, UIC also offers online master's of engineering degrees in fields such as bioinformatics, chemical engineering, and computer science. Most students complete required 36 credit hours in two years. Coursework varies by program, but curricula cover topics such as computational genomics, computational molecular modeling, and electromagnetic compatibility. UIC's online engineering master's programs do not require a thesis or research project. All students complete courses in engineering law and engineering management. UIC delivers online courses asynchronously through the Blackboard learning management system. Applicants must have a bachelor's degree from a regionally accredited institution and must have a minimum 3.0 GPA in their final 60 credit hours. Students must complete the program within six years of admission. Transfer students must earn at least 24 credit hours through UIC. Students have free access to online tutoring. The University of Illinois at Chicago is regionally accredited by the Higher Learning Commission (HLC). Arizona State University–ASU Online ranks among The 50 Best Online Master's in Engineering Programs! Founded in Tempe in 1888, ASU is among the largest public universities in the nation by student enrollment. The university offers online master's in engineering degrees in fields such as engineering management, engineering science, and materials science. To earn their online master's, engineering students complete 30 credit hours over two years. ASU's programs are ideal for working professionals with a limited timeline. Some programs offer a choice between a thesis project and a portfolio. The materials science and engineering program includes courses in advanced thermodynamics, structural and mechanical properties of materials, and materials physics. The master's in sustainable engineering program requires coursework in advanced earth systems engineering and management, lifecycle assessment for civil systems, and sustainable constructions. ASU delivers online courses through Blackboard, and instructors may incorporate synchronous and asynchronous elements. ASU Online also offers a dual master's degree, combining an MBA with their master's in engineering. Applicants must have a bachelor's degree from an ABET-accredited institution and a cumulative GPA of at least 3.0. ASU students must maintain a 3.0 GPA. Arizona State University is regionally accredited by the Higher Learning Commission (HLC). Oklahoma State University ranks among The 50 Best Online Master's in Engineering Programs! Founded in 1890, OSU's affordable online programs are ideal for working professionals, military personnel, and distance learners. The university's offers several engineering master's programs online, including degrees in nuclear, industrial, electrical, and computer engineering. OSU offers online students flexibility in structuring their program. For example, the industrial engineering and management program requires 30 credit hours, but students can complete an alternate 33-hour program with an independent study or department-approved elective in place of the final thesis project. Students access courses asynchronously through Blackboard. OSU's industrial engineering and management degree provides technical knowledge and business and management skills. Navy personnel may earn up to 12 credit hours for nuclear engineering training completed through BRES or the Nuclear Power School. OSU does not award graduate credit for prerequisite courses. Applicants must have a relevant bachelor's degree from an ABET-accredited institution, at least a 3.0 cumulative GPA, and a minimum quantitative GRE score of 158. OSU students must maintain a 3.0 GPA. Oklahoma State University is regionally accredited by the Higher Learning Commission (HLC). 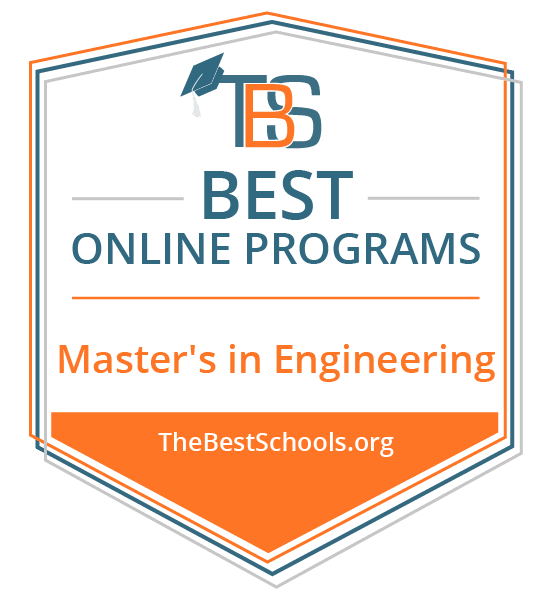 Auburn University ranks among The 50 Best Online Master's in Engineering Programs! Auburn University has offered a liberal arts education coupled with relevant occupational training since 1856. More than 250,000 scholars maintain a degree from this land-grant university, whose accessibility continues to expand as more programs are available remotely. The university currently offers a variety of online graduate programs, including one of the most versatile engineering master's programs online, which offers more than 10 concentration options. Students interested in earning their online engineering master's with a specialization in areas such as aerospace engineering, electrical and computer engineering, or engineering management, have the opportunity to earn their degree entirely online. This degree consists of 30 to 33 credits, including 21 credits of concentration coursework. Course topics include advanced structural analysis, engineering thermodynamics, and orbit determination. Prospective students who are unsure of their professional path, or those who wish to gain diverse skills, may pursue this school's master's in engineering interdisciplinary degree. This program does not require a thesis and allows students to take courses in areas such as chemical engineering, computer science and software engineering, and mechanical engineering. Full-time students can earn their degree in approximately two years, and students may take up to 10 years to complete the curriculum requirements. Transfer students may apply six credits toward their degree. Auburn also offers an MBA / master's in engineering dual degree program. Auburn University is regionally accredited by the Southern Association of Colleges and Schools (SACS). A master's in engineering affords you the opportunity to enter lucrative STEM positions. However, graduates also have valuable skills in thinking critically, communicating effectively, and working both independently and collaboratively, as well as a strong foundation in mathematics, physics, and design. As a result, students who graduate from an online engineering master's program may also pursue careers in fields such as business or consulting. Aerospace Engineer: These engineers design and manufacture aircraft and aerospace products, making certain they comply with safety and environmental standards. Aerospace engineers also perform cost analysis to determine the financial feasibility of projects. An online engineering degree is useful in this occupation because it gives students an in-depth understanding of concepts like propulsion, mechanics, and aerodynamics. Top Executive: Leaders in either the for-profit or nonprofit sector, top executives develop the strategies necessary to achieve organizational goals and ensure optimal performance. The role requires a solid understanding of finance, change management, organizational behavior, and general operations. Moreover, it mandates the ability to enact cost-savings plans when necessary. Management Analyst: These analysts help improve organizational efficiency. They conduct financial analysis, site observations, and interviews with personnel to make an informed suggestions for new procedures and systems. Earning a master's in engineering strengthens the analytical and critical thinking skills required in this career.